Following the French Revolution, Napoleon in 1801 brought religious peace to France. The country was still Catholic, especially rural France. Pierre Perboyre and his wife Marie on a small farm in Puech near Cahors typified the French peasant’s faith. God blessed them with eight children. Three sons became priests in the Congregation of the Mission (Vincentians), and two daughters entered the Daughters of Charity of St. Vincent de Paul. The eldest son of Pierre and Marie, John Gabriel, was born on the 6th of January 1802. In 1816 John Gabriel accompanied a younger brother, Louis, to a high school in Montauban that had been started by their uncle, Fr. Jacques Perboyre, C.M., to prepare young men for the seminary. In the Spring of 1817, his teachers noting John Gabriel’s intelligence and piety suggested he remain with his brother and continue his studies. Though willing to return home if needed on the farm, John Gabriel wrote to his father that he believed that the Lord was calling him to the priesthood. From his earliest days in the seminary, John Gabriel had longed for the China mission. In 1832, however, his superiors appointed him a novice director in the Vincentian Motherhouse. The departure of some Vincentians to China in 1835 renewed his missionary longing. Poor health stood in the way, but finally his doctor saw the voyage to the Orient as a possible cure. Five months at sea brought John Gabriel to Macao where he studied Chinese. In December of 1835, Father Perboyre, along with several missionaries, set sail from Macao in a Junk. Since the Chinese law forbade the entry of Christian missionaries, the Christian captain and crew disguised themselves as merchants and smuggled John Gabriel on to the mainland of China. 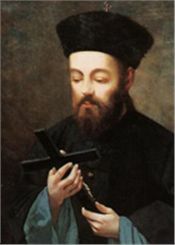 Following a five month overland journey to the Vincentian mission center in Ho-nan, Father Perboyre suffered a severe attack of fever that forced him to rest for three months. But he was able enough to continue his mastering of the Chinese language. In the company of two Chinese Vincentians he spent the years 1837 and 1838 reanimating the faith in Catholic villages by preaching, catechizing and administering the sacraments. Some of the Vincentian mission areas were desperately poor and John Gabriel shared the meager fare of his flock. For more than a century, China outlawed Christianity and had a death penalty on all Europeans attempting to spread the faith. Authorities often overlooked this law, but in 1839 the Viceroy of the province of Hu-pei began a persecution and used his local Mandarins to obtain the names of priests and catechists in their areas. In September 1839, the Mandarin of Hu-pei, where there was a Vincentian mission center, sent soldiers to arrest the missionaries. Warned of the danger by some Christians, the priests scattered in different directions. John Gabriel hid in a bamboo forest, but a beaten and tortured catechist led the soldiers to him. Frequently tortured in prison, Father Perboyre refused to betray his faith and his associates. In May 1840 his case went to the Emperor where he was found guilty of preaching Christianity and condemned to death. John Gabriel Perboyre was executed on September 11, 1840, in the Chinese custom of being tied to a stake and triple strangled. Andrew Fong, a generous and valiant catechist who had aided Father Perboyre in his imprisonment, retrieved his body and buried it in the Christian cemetery where Blessed Francis Regis Clet, C.M., was buried. Both their remains now repose in the chapel of the Vincentian Motherhouse in Paris, France. The heroic suffering and death of John Gabriel led to his beatification in 1889. And in recent times, Pope John Paul II canonized him as Saint John Gabriel Perboyre, C.M., on June 2nd 1996.